Volvo V70 Mk2 97-00 pre-facelift black relay 9441158 ,. Fits Volvo All Models (1990 - 2015). 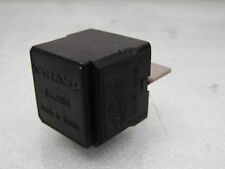 Genuine Volvo5 Pin Black Relay / Multi Purpose Relay. Number of PIN: 5 PIN. Part number 3533937. C70 S70 V70 Xc70 1998-2000. S40 V40 1996-2000. Genuine Volvo 6 Disc Cd Changer. 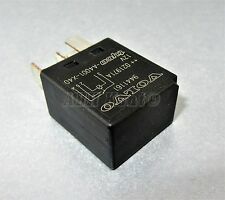 Genuine 5 PIN Multi-Use Black Relay. Fits Volvo All Models (1995 - 2016). Make: Volvo. Fits both LHD & RHD cars. Number of PIN: 5-PIN. Brand new Foglight Relay to fit: Volvo V70 up to 2002 Fits in position RMI 06. Brand new Brake Light Relay to fit: Volvo V70 up to 2002 Fits in position RMI 05. IF YOU HAVE A GENUINE VOLVO RELAY FITTED TO YOUR VEHICLE, YOU WILL BE ABLE TO SEE THE OE. THE RELAY WILL SUIT FOLLOWING APPLICATION UNLESS STATED IN YOUR NEWER MODEL THAT TAKES THOSE PART NUMBER. 740/ 940 from 1985 - 1994. GenuineVolvo 4 Pin Black Relay / Multi-Use Relay. Fits Volvo All Models (1995 - 2016). GenuineVolvo Part. Fits both LHD & RHD cars. Made inPortugal. PART NUMBER 9434225. V70 C70 S70 ; MY 97-00. 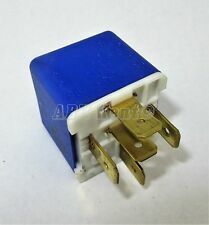 GENUINE VOLVO FUEL PUMP RELAY. 850 ; MY 92-97. VOLVO C70 S70 V70. S70 AND V70 1997-2000. ALARM FOB RECEIVER RELAY MODULE. S60 AND V70 2000-2004. C70 1997-2006. V70 2004-2007. WE ARE BREAKING DIFFERENT VOLVO MODELS WE ARE BASED IN SOUTHAMPTON. 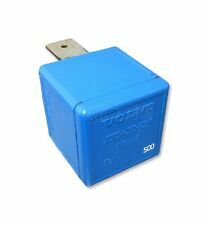 Brand new Electronic Module Relay to fit: Volvo S60 2001 up to 2007. Volvo S80 1999 up to 2006. Volvo V70 2001 up to 2007. Volvo XC70 2003 up to 2007. Volvo XC90 2003 onwards. This relay is the most common relay fitted into the CEM (Central Electronic Module) and REM (Rear Electronic Module). Part number 9441160 V23134-A52-X345. Taken from a 2005 V70 D5 185 BHP which has been in the family for the past 4 years. Volvo multi purpose black relay. Item may have general marks/scratches etc on it, but item is in a good useable condition. Collection also available in the Hull area. 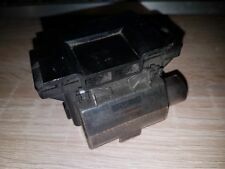 VOLVO S40 SALOON (Mk1, PHASE 2, 2001-2003)RELAY (Removed from a right hand drive car). THIS RELAY IS FROM A YEAR 2001 VOLVO S40 4 DOOR SALOON 1.6i PETROL ( Engine Code B4164S) 5 SPEED MANUAL. VOLVO V50 2009. All parts are for sale exactly as shown on the picture. We won’t take any responsibility for the compatibility of parts unless we have explicitly said it will fit. Compatibility of parts. PART NR : 30778644. SERVOTRONIC RELAY. VOLVO S60 S80 V70 XC70. S60 AND V70 2000-2004. S80 1999-2003. S70 AND V70 1997-2000. V70 2004-2007. WE ARE BREAKING DIFFERENT VOLVO MODELS. PART NUMBER: 9442303 / 5KG005311-07. TESTED & WORKING. Front Wiper Interval Relay for a number of older Volvo models. Item is used taken from a used car. Item may have general marks/scratches etc on it, but item is in a good useable condition PayPal only Free postage in the U.K. Only **For all international shipping please use the eBay GSP (Global Shipping Programme) where available. For Items Not Covered by GSP Please Arrange your transport/courier. Item will be packaged for shipping as requested ** Item will be sent/collected once payment has been confirmed Collection also available in the Hull area. SUITS ONLY K JETRONIC SYSTEM OEM 1348600. IF YOU HAVE A GENUINE VOLVO RELAY FITTED TO YOUR VEHICLE, YOU WILL BE ABLE TO SEE THE OE. THE RELAY WILL SUIT FOLLOWING APPLICATION 240 ALL MODELS 1978- 1985 INCLUDED TURBO MODELS. VOLVO V40 (FIRST GENERATION, PHASE ONE, 1995-2000 ) RELAY. THIS RELAY IS FROM A YEAR 1999 VOLVO V40,(V.REG), 5 DOOR ESTATE / STATION WAGON. 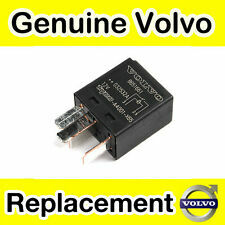 Genuine Volvo, part number 9442190A. Removed from a 53 plate S60 2.5T, should fit other Volvo's. Volvo 12v multi function 5 pin relay. I will chase them up. ENGINE - 2.0 PETROL B200E. REMOVED FROM - VOLVO 740 SE ESTATE. IT LISTS RANGES OF VEHICLES A PART MAY FIT, HOWEVER IT DOES NOT TAKE INTO ACCOUNT ENGINE CODES, TRANSMISSION, TRIM/FACELIFT MODELS ETC. All parts are from UK standard Right Hand Drive vehicles unless otherwise stated. VOLVO PART NUMBER: 9441160 V23134-A52-X345. 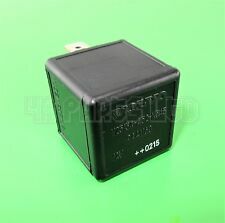 VOLVO XC90 XC70 S60 S80 V70 BLACK RELAY IN GOOD USED CONDITION. Part Number:895185000. GenuineVolvo Part. Condition:Used and Good Working Order. PART NUMBER 9442468. 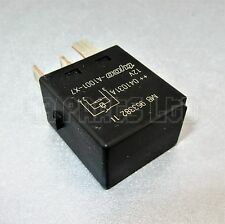 GENUINE VOLVO 3 PIN FLASHER RELAY. 240 740 940. Part No. : MB95338211 / A1001X7 / 95338211. Black Tyco Relay 12V 4 Pin Plug. Mitsubishi Shogun L200 Pajaro space star etc. Number of PIN:4. Part Number:898797000. GenuineVolvo Part. OE 1235067. THEY ALL TESTED. NOS VOLVO V40 96-04 REAR WIPER RELAY may fit other models. Original Volvo part from a 2005/54 V70 D5 Sport in Mystic Silver with just 133K. Interior trim code AG70. New and used car spares. Bosch Multi Purpose Relay 0332 204 102 ; originally on a Volvo. A "multi purpose " relay originally on a Volvo 240 but likely to have been used on quite a few older vehicles. All parts are from UK standard Right Hand Drive vehicles unless otherwise stated. IT LISTS RANGES OF VEHICLES A PART MAY FIT, HOWEVER IT DOES NOT TAKE INTO ACCOUNT ENGINE CODES, TRANSMISSION, TRIM/FACELIFT MODELS ETC.